PATRICK CAULFIELD was educated at St. Mary’s C.B.S., Mullingar and University College Dublin graduating with a Bachelor of Civil Law degree in 1979. 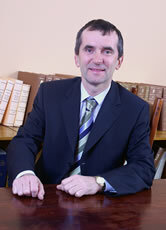 Patrick was admitted to the Roll of Solicitors in 1982 when he joined the firm, becoming a partner in 1988. His practice areas are in Conveyancing, Probate and Litigation including Family Law. Paddy is an active member of both Mullingar Golf Club and Mullingar Tennis Club. He takes an interest in all other sports and enjoys reading and music.